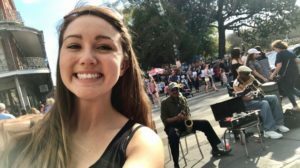 After reading my first two blogs, I’m sure you are now super excited and currently making plans for a trip to New Orleans! However, with all of the sightseeing and exploring that you do in NOLA, you will be working up a big appetite. So, why not check out some of these very well known places to eat and drink. I honestly don’t think you could go wrong eating anywhere when it comes to New Orleans. All of the food is extremely delicious. During my trip, I went to multiple places and ate a lot of great food. Out of all of these, my favorite by far was the famous, Café Du Monde. This is probably because I have a big sweet tooth and strong love for coffee. Regardless, this place has the tastiest beignets. The line is always long at all hours of the day. However, I recommend finding a spot in line because the wait is well worth it. As you probably already know, New Orleans is known for not only the great food, music, and festivities but also their bars. While in the city, I went to a few bars and saw some great live music. Listed below are places that I recommend checking out while on your trip. Fun fact: You can stop to get a drink and take it on the go while you tour the city. If you plan to incorporate any of my suggested New Orleans activities within your trip itinerary, you’ll be able to conveniently make a stop to a couple of these suggested bars. For example, if you take a ghost tour with French Quarter Phantoms, you will begin your journey at the Voodoo Lounge. Similarly, if you catch a show at Preservation Hall, you can treat yourself to some delicious hurricanes from Pat O’Briens located just next door. These are all just a few recommendations of places to go when adventuring the Big Easy. 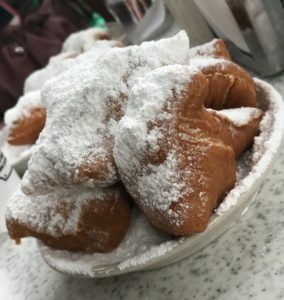 If you have any other suggestions of great places to eat and drink in NOLA, feel free to leave them in the comments below! 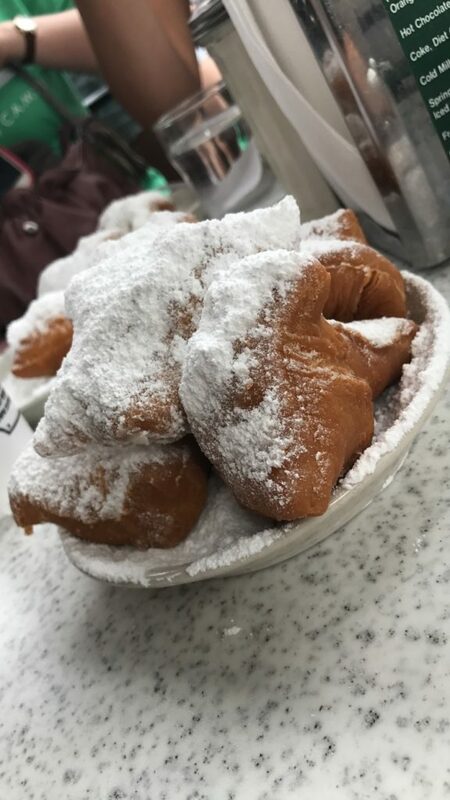 I told you my ultimate favorite place and thing to eat in New Orleans, now it’s your turn. I can’t wait to hear your favorites! Take a look at the pictures I took on my trip to NOLA. 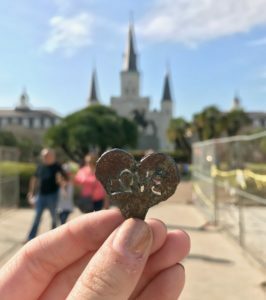 After reading my previous post, Experiencing the Artsy Culture of New Orleans, you now understand the unique atmosphere of the city known as, “The Big Easy.” It’s hard not to fall in love with this spectacular city as it is so different than most of us are typically used to. With that being said, if you are planning to travel to New Orleans, I can assure you that you will never be bored. There are tons of places to go and adventures to embark on. 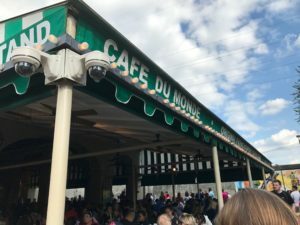 During my recent trip to NOLA, I went to a lot of notable places that I highly recommend visiting if you are in the area. To start, you must take a stroll through Jackson Square Garden. This historic garden is absolutely beautiful and a “must see” tourist spot. While you’re in the French Quarter, walk around the block to admire all of the local artwork and stop to see a few street performers. Within that same area, you can walk over to the riverfront and view the Mississippi River. 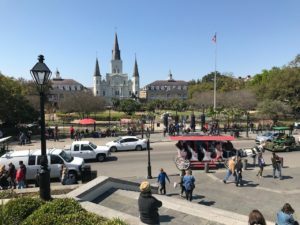 Not only are these some great historical sights to see during your trip to New Orleans, but they are also completely free of charge which makes the experience even better! 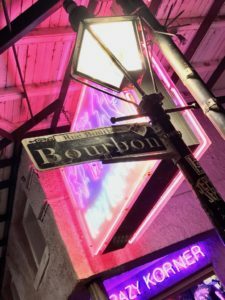 Outside of these key spots, I also recommend checking out Royal Street and of course, Bourbon Street. These two are both located within the French Quarter and are some of the most famous streets in New Orleans. Royal Street is known for its many places to shop as well as its entertaining street performers. Bourbon Stree, on the other hand, is universally recognized for its nightlife activities. . 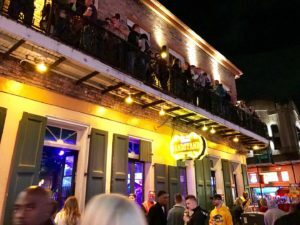 So, if you aren’t sure what to do at night in NOLA, jst head down to Bourbon Street, and you will have many options to chose from. However, before heading out, take a look at Chicken on the Bone’s schedule, figure out where they are playing, and go listen to their awesome band for a few minutes. If you’re lucky, they may even invite you up on stage! There is always something to do in New Orleans. For instance, you can go to one of the many museums that the city has to offer. In fact, there are over 45 museums, and they all are different types. 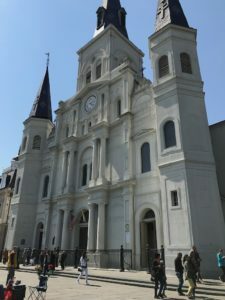 You also can take a free, self-guided tour of the beautiful St. Louis Cathedral. Or, if you’re in the mood for something spooky, you could go on a ghost tour like our group did. We decided to take a walking ghost tour with French Quarter Phantoms. We had an awesome guide who told us many New Orleans vampire and ghost stories and showed us the “haunted” houses associated with each. He even showed us the house that was featured in American Horror Story. 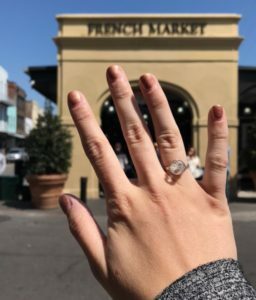 Another cool thing to do while touring the city is visit the French Market. I loved smelling the delicious New Orleans food and seeing all of the handmade items people were selling at the market. As a memento of my trip, I purchased a couple of handmade rings that a local designed for me right on the spot. At her booth, there was a box filled with hundreds of stones to pick from. Once I chose a stone, she matched it with wire, measured my finger, and created the ring. My final recommendation for you is to purchase some show tickets at Preservation Hall. This place holds multiple live jazz concerts every single night. 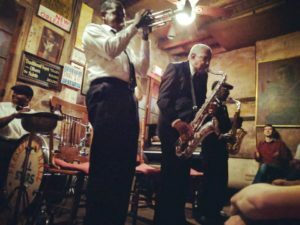 Being the birthplace of jazz, it’s only right for you to enjoy some of this fabulous music while on your New Orleans trip. There is an endless amount of activities to do and things to see in this city. 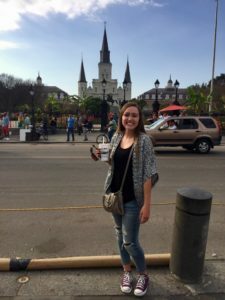 These are just a few of my favorite things to do while in NOLA, but I hope they give you a great start when planning your next trip. However, if you’ve already been and have some other great recommendations of sightseeing adventures or places to explore in New Orleans, leave them in the comments below! Upon arriving in the city on the first day of my trip, I was in awe of how much raw talent lies within the streets of NOLA. Almost every street was filled with talented individuals showcasing their own personal niche to the crowds of people walking by. The talents varied from art to entertainment, but regardless, they all made you want to stop and admire what they were doing. All forms of remarkable art were for sale along the streets. The art ranged from beautiful canvas paintings to locally found sheet metal that was transformed into hand drawn and cut designs. Some even used their creative content writing skills to formulate on the spot poetry for tourists walking by. As for the entertainment, there were many street performers throughout the city. Some displayed their musical abilities through singing, dancing, and playing instruments while others used different methods of entertainment to attract a crowd. For example, I saw multiple magicians, palm readers, tarot card readers, comedians, face painters, human statues, and much more. Tourist tip: Depending on their talent, if they catch you taking a picture (like of a human statue), they will expect you to tip! 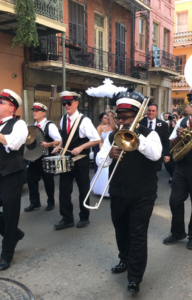 Outside of the stationed artists and performers that are out daily, you may even catch some wonderful celebrations parading through the streets. There are always festivities occurring in New Orleans, and I was lucky enough to witness two different types of parades. The first was like any other. It was a parade performance centered around the current holiday. In this case, I went down the week of St. Patrick’s Day and saw a couple of really neat parades. I also got the unique experience of witnessing a famous New Orleans second line parade. These historic parades are used for all types of events. They can range all the way from funerals to weddings. The funeral parades are not meant to symbolize sadness, but instead, a celebration of a loved one’s life. As for weddings, these are used to recognize and congratulate newlyweds on the beginning of a wonderful journey that they will share with each other. 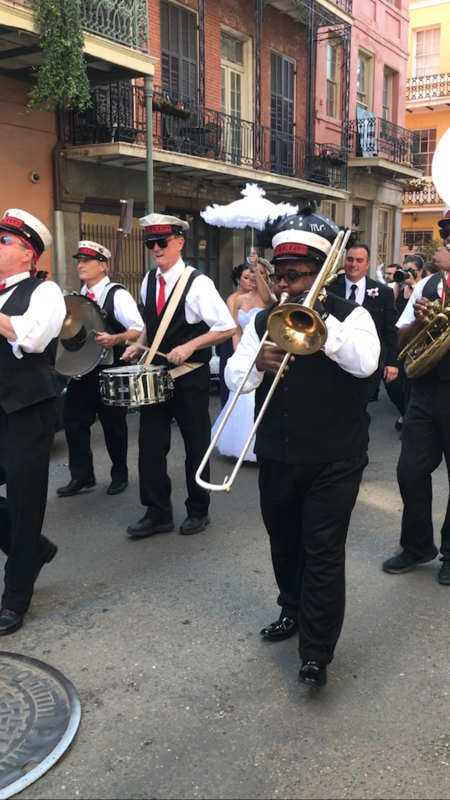 When I was in NOLA, I saw a wedding second line parade, and it was by far an awesome experience. I quickly learned the reason behind the city’s beloved nickname, “The Big Easy.” New Orleans is filled with carefree souls who love to have a good time and embrace every aspect of the joys of life. The atmosphere held a constant vibe of positivity and passion for art that radiated among the people of New Orleans. I instantly admired the easygoing attitude of the locals and the lack of judgment that they had for one another. Being in this city opened my eyes to how a lot of cultures are so caught up in their own ways. We easily forget to embrace who we truly are, and we care too much about what our peers think of us. New Orleans showed me that anything in this world is worth celebrating, whether it’s for the good times or bad. It also reminded me to fully enjoy life, be who I am, and always do what makes me happy despite what others may think. I would love to go back to this artsy, full of life city again one day soon. Until then, I look forward to embracing the next adventure that life throws at me. Stay tuned to read more about my exciting trip in New Orleans, Louisiana!